I'm pleased to have checked another item off my project list. 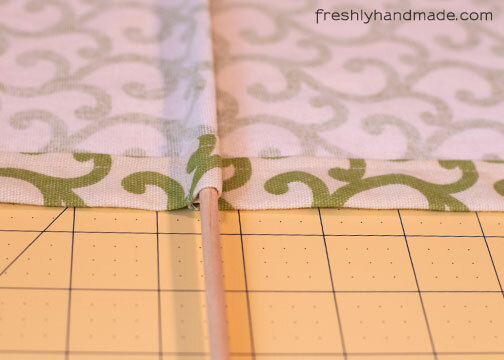 I've gone without any type of window covering in my project room for several years, but I've had the materials to make a roman shade for a while now. Finally, I can work during the wee hours of the morning without the feeling that someone could be peeking in at me in my pajamas. I love roman shades for their simple style and versatility. They look good on there own or can be paired with long curtains. 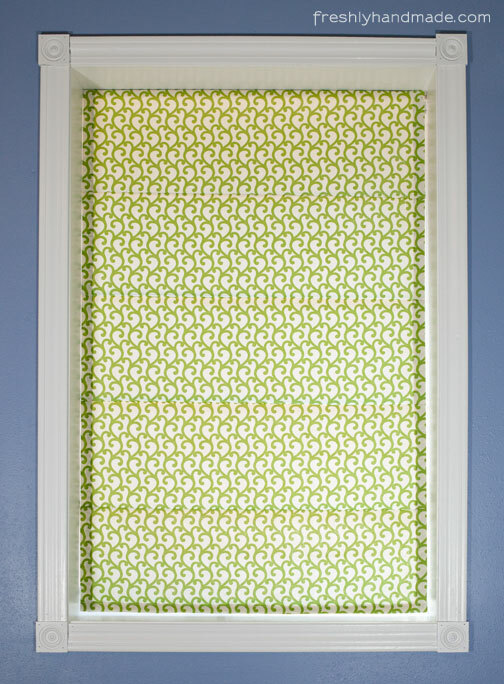 I made a lot of these shades for my previous home and a couple for the one that I live in now. 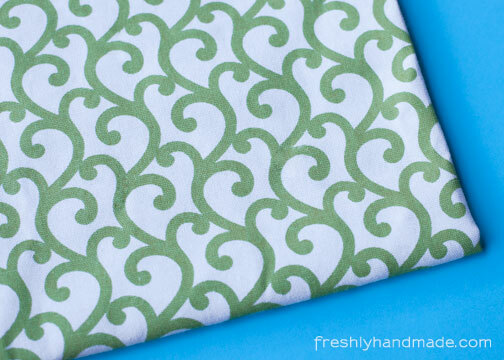 You can pretty much use any fabric, but I've found using a heavy weight cotton decorator fabric or cotton duck works best. 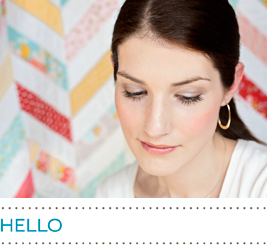 Plus, you don't need to line the shade with these types of fabrics. Custom-made shades like this can cost you big bucks, but I was able to make mine for around $15. The materials listed below were required for the size shade I made to fit my window. The quantity of materials that you will need may be different based on the size of your window. Electric drill with drill bits and screw driver bits. 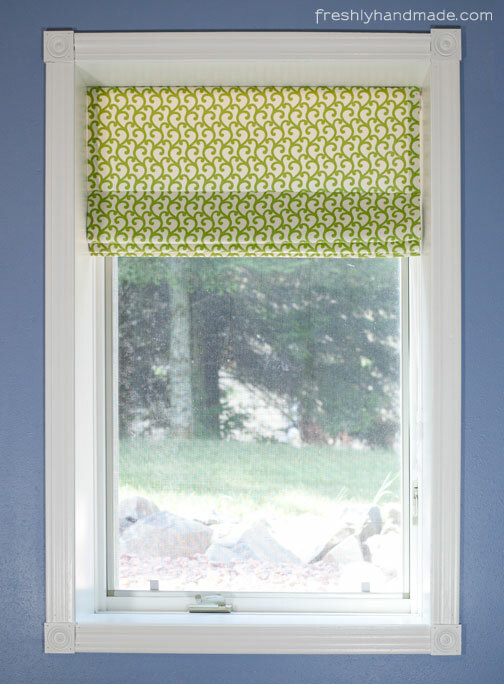 Measure the width and height of the inside of the window where the shade is going to sit. I recommend doing so in a few locations in case your window is not square. 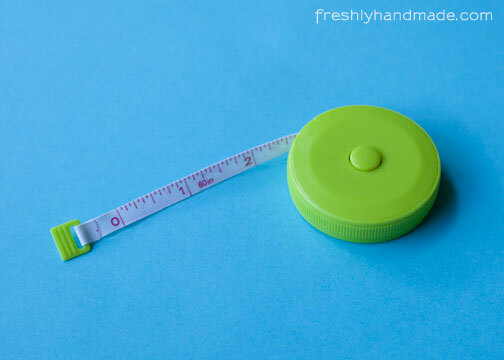 Document the smallest dimension for both width and height. 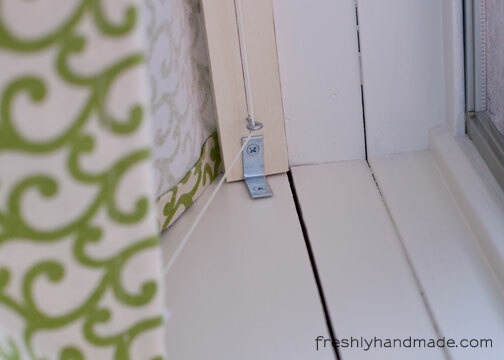 Subtract 1/2" from the width so that the shade will operate without touching the inside of the window. The finished shade size for my window was 28-1/2" wide x 45" high. 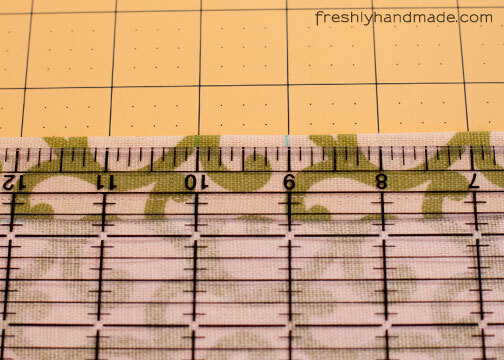 Add 3" to the finished shade size width. Add 6-1/2" to the finished shade size height. 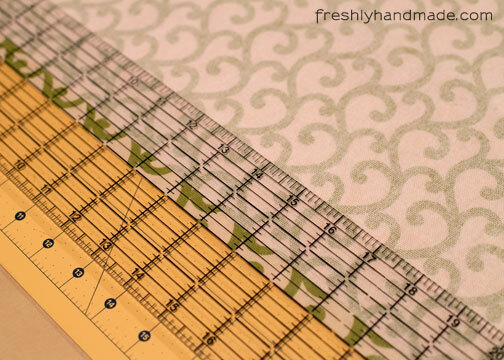 The fabric cutting size for my window was 31-1/2" wide x 51-1/2" high. Below shows you how the material will be used. This formula gives you 5 panels of equal heights. Mine were 9" high, but your panel height will be determined by dividing 5 into your finished size height. 1. 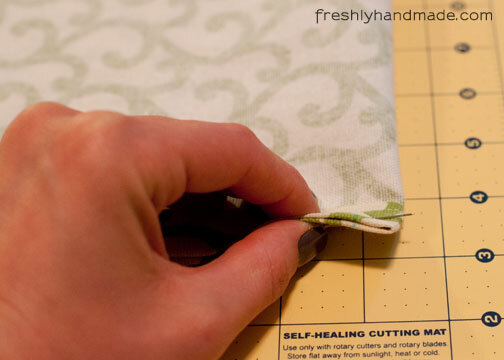 Cut the fabric to the cutting size. 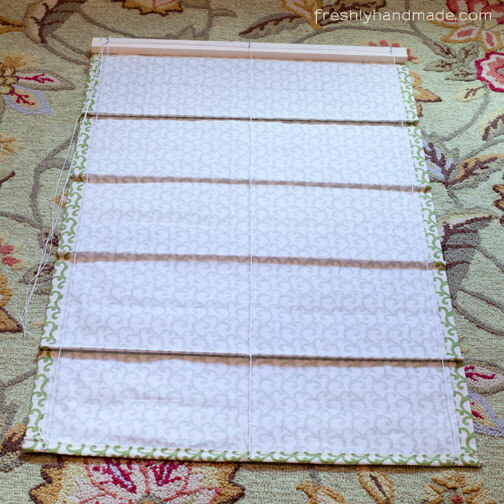 Lay the fabric flat with the wrong size facing up. 2. With the water-soluble pen, mark 1" in along the entire length of the long side. 3. 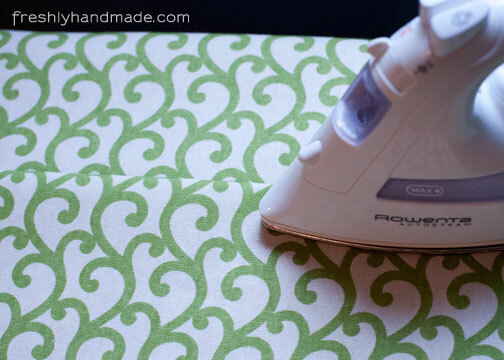 Fold edge up to markings, pin and press with an iron. Make sure not to iron over the pen markings, as the heat could make them permanent. 4. 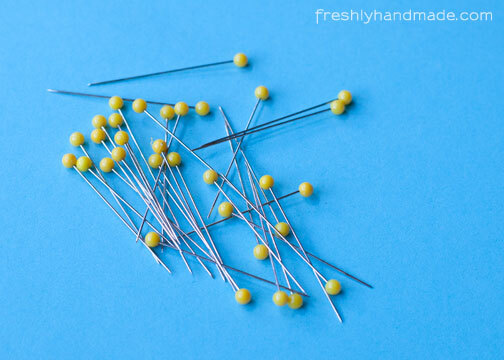 Remove pins. From the folded edge, mark 2" in along the same long side. 5. Fold edge up to markings and pin. 6. Sew along inner edge about 3/16" to create side seam. 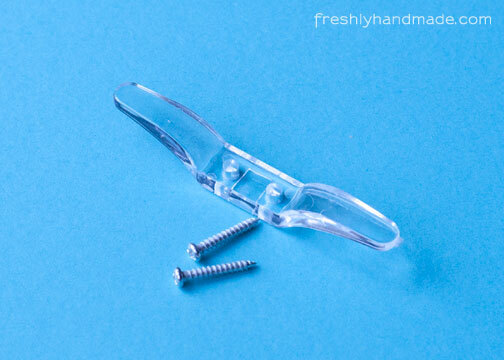 Remove pins and press seam flat. 7. Repeat steps 2-6 on the other side. 8. 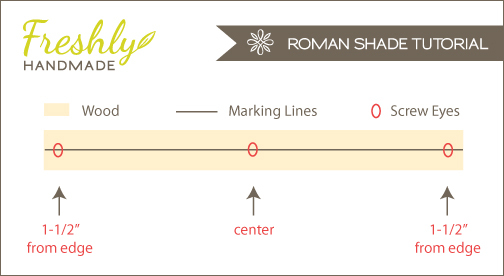 According to your pattern design, determine the bottom of the shade. 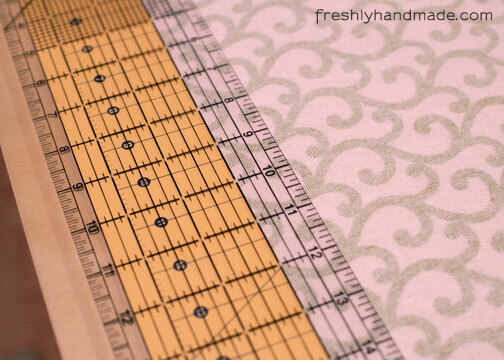 Repeat steps 2-6 for the bottom seam, which will also become a dowel pocket. Back stitch at both ends. You should now have 3 finished sides. 9. Lay the shade flat with the wrong side up. Next you will make marks for the dowel pockets. 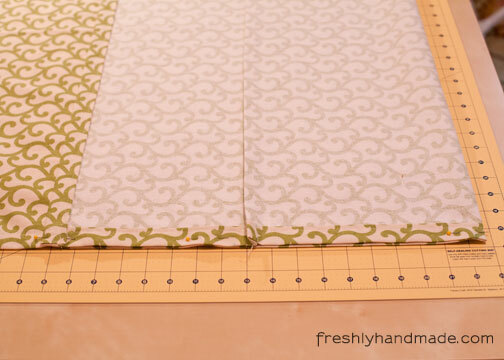 Starting at the bottom edge, mark the fabric along both side edges at the panel height measurement. My panels were 9" tall so I made my mark at 9". Make a second mark 1" further. My first set of marks were at 9" and 10" from the bottom edge. Move the ruler to the second mark and mark again at your panel height dimension, as well as 1" further. For me, I moved the ruler to the 10" mark and marked again 9" and 10". 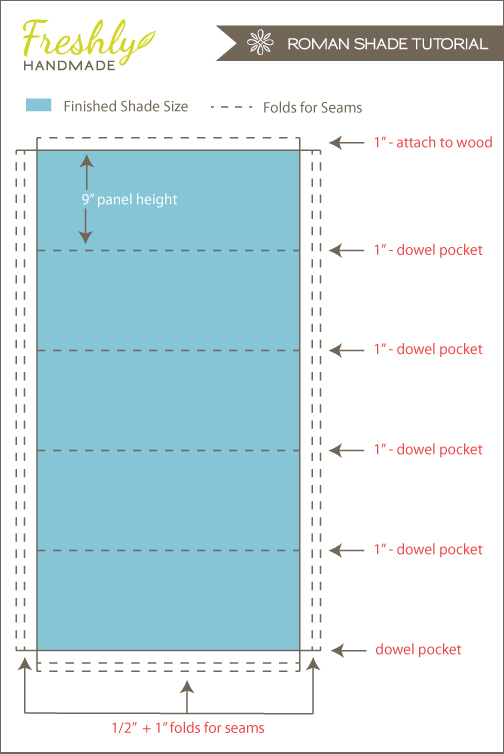 Repeat this on both sides until you have markings for 4 dowel pockets. 10. Flip the shade over so that the right side is facing up. 11. Fold the bottom edge up and match the first set of markings. 12. Pin on both sides. I like to also pin the bottom edge of the shade to the sides so that the horizontal lines stay aligned. 13. 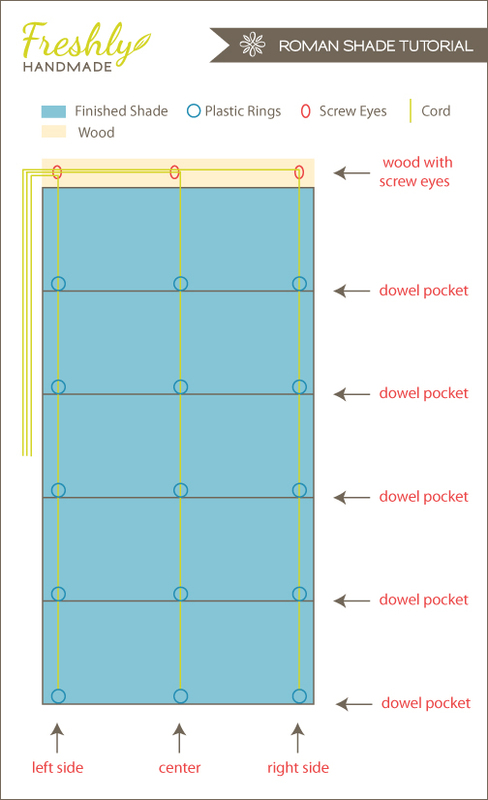 Sew 1/2" in from the fold to create the dowel pocket. Backstitch at both ends. 14. Remove pins and iron open seam on right side. 15. Lay the shade flat, right side facing up. 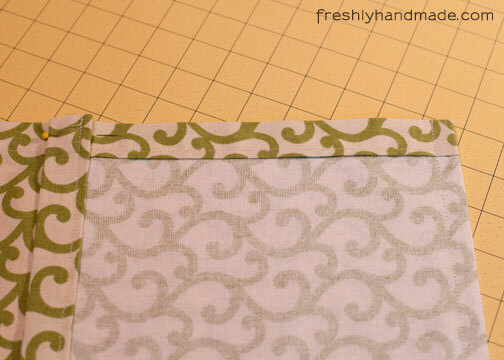 Fold the bottom edge up until the next set of marks meet. 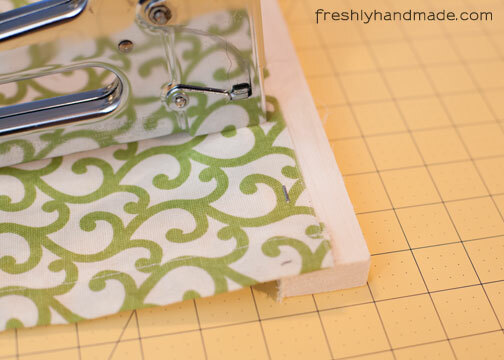 Pin along both sides and repeat steps 13 and 14. 16. Continue to match the marks and sew the dowel pockets until you have 5 panels. You will have an extra inch of fabric at the top that will fold over the top of the wood, which won't be seen when the shade is installed. 17. 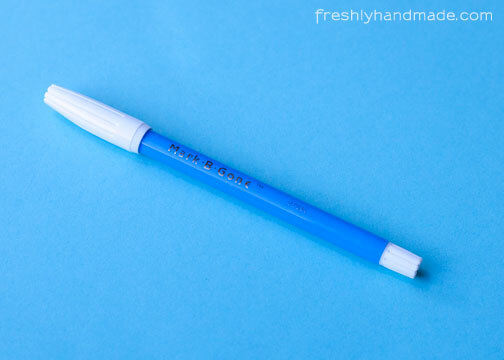 Remove any pen marks by spraying them with a water bottle. 18. With a pencil or pen, mark 1" on both ends of the piece of wood. Draw a straight line across. 19. Line up the top raw edge of the shade to the horizontal line on the wood. The side edge of the shade should align with the side edge of the wood. Staple the shade to the wood. 20. Flip shade over so that the wrong side is facing up. 21. Insert the dowels in the pockets. 22. On the underside of the wood (opposite of the stapled side), mark the middle of the wood and draw a horizontal line across the width of the wood. 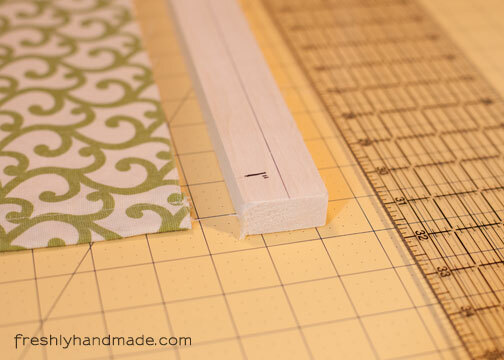 Along the line, mark the center and in 1-1/2" from each edge with a vertical line. Drill pilot holes in the 3 different positions and install the screw eyes so that the hole is perpendicular to the horizontal line. 23. With the wrong side still facing up, fold all the panels up so the dowel pockets are next to each other. 24. 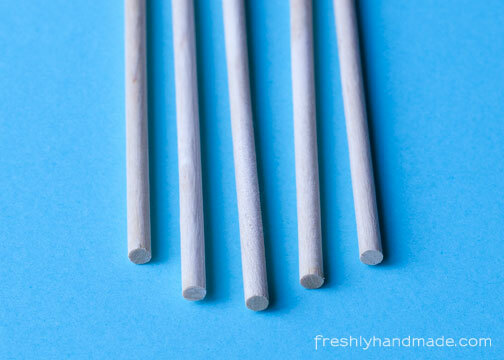 With the water-soluble pen, make a mark on each dowel pocket that aligns vertically with each of the screw eyes. 25. 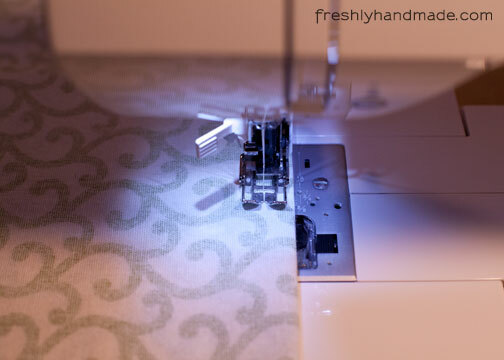 Hand stitch a plastic ring at each of the marks. Stitch several times through, tie off and trim the threads. 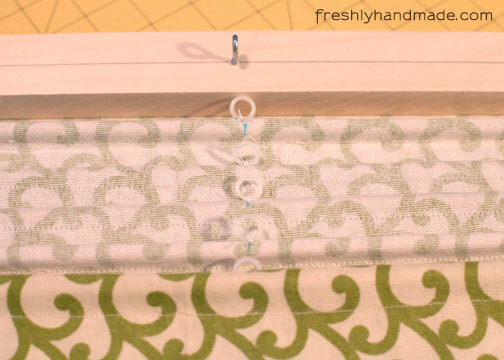 Make sure that you sew the ring so that it is parallel with the pocket dowel. 26. Unfold the shade, still laying flat with the wrong side up. 27. Starting with the set of rings on the right side, tie a knot with the drapery cord to the ring on the bottom edge. Thread the cord up through all the plastic rings, then thread through the screw eye from right to left. Thread the same cord through the screw eye in the center and on the left side. 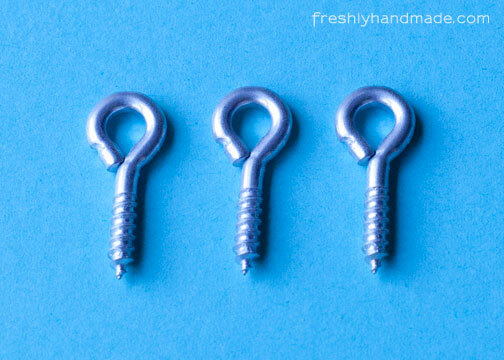 Allow about 24" loose cord to hang from the last screw eye. 28. Move to the center set of rings. Repeat the process with a separate piece of cord by tying a knot to the bottom ring and threading up through all the rings. Thread through the center screw eye and then through the left side screw eye. Again, leave about 24" loose cord. 29. Repeat for the left side set of rings. Thread only through the left side screw eye from right to left. Again, leave about 24" loose cord. 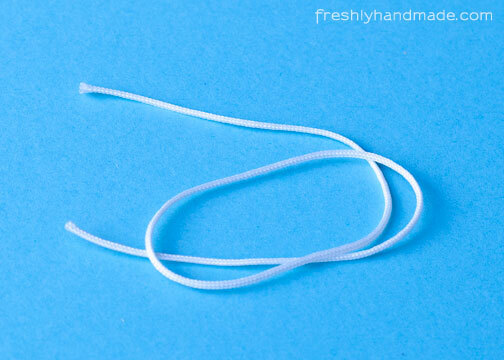 If you are left-handed, you may want to thread the cord to the reverse side so that it is easier for you to operate the shade. I highly recommend having someone to help you with this process to prevent profanity from escaping your mouth. I actually installed mine by myself, but endured much frustration and minor injury. 1. Mark the holes for the L-brackets on both the piece of wood and on the inside of the window. The bracket is going to be installed on the same side of the wood as the screw eyes. The stapled side of the wood will touch the top of the inside of the window. 2. Drill a pilot hole in the middle of each circle. 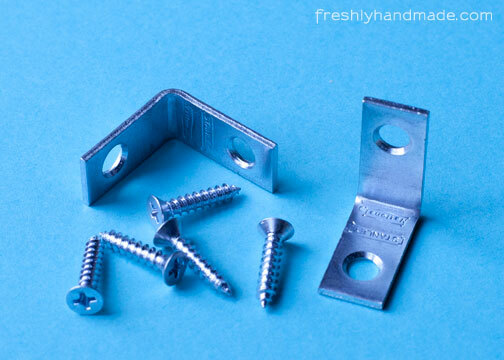 Screw the bracket to the side of the inside of the window first, then screw the bracket to the wood. Photo below shows the view looking up. 3. 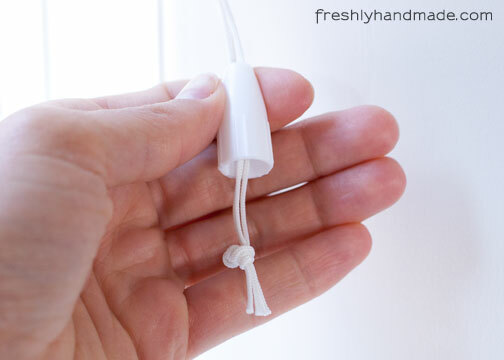 Take the 3 loose hanging cords and feed them through the cord pull, small hole up. 4. 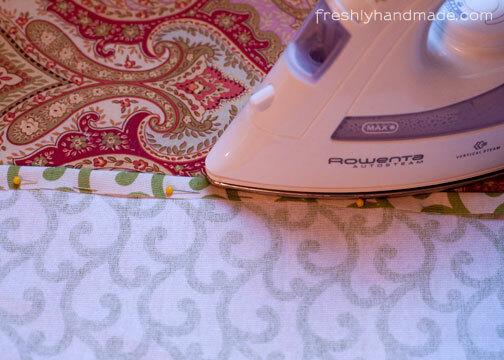 With the shade completely down, straighten all loose cords and tie the bottom in a knot. The cord pull will hide the knot when it slips over the top. Trim the ends of the cord. 5. 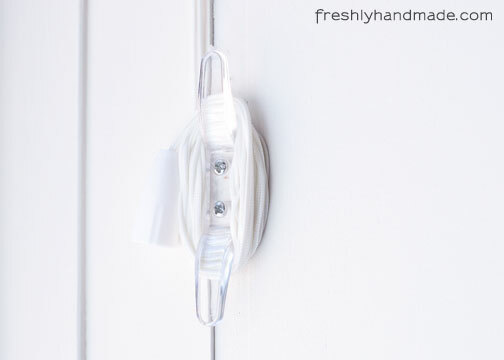 Install the window cleat on the same side of the window as the cord pull. 6. 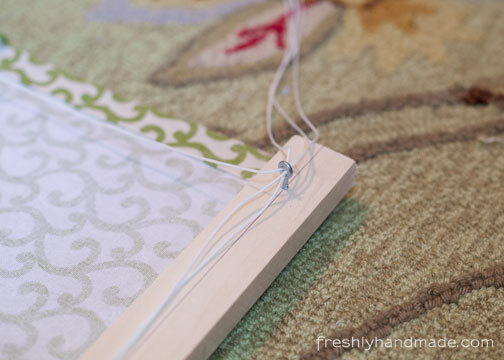 To finish up, trim any loose ends of thread and cord. 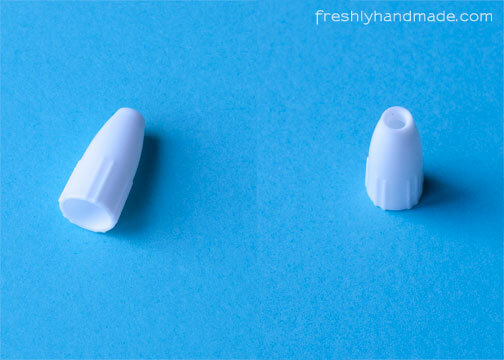 Apply a dab of super glue to the cord knots on the bottom dowel pocket to prevent them from coming loose. Enjoy the stylish privacy it brings to your room. Thank you so much. I myself have been longing for roman shades, but afraid to start them. Thanks to you and your wonderful instructions and photos, I'm all set. Will be looking for the fabric now and the supplies needed and will be making at least nine shades for two different rooms. 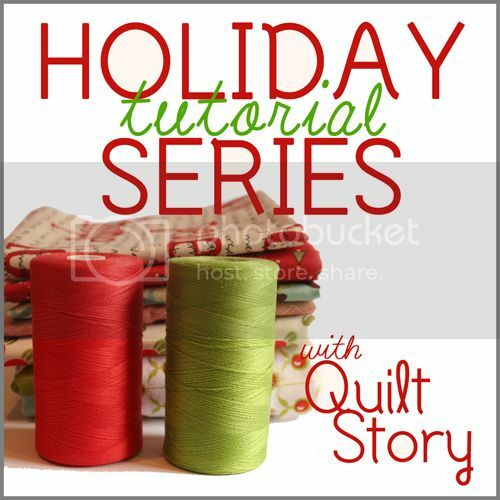 Thanks again for your time and sharing this with others that love to sew. Thanks for the tutorial. I followed the instructions and mine turned out awesome! It was slightly more complicated due to mine being lined but I figured it out. 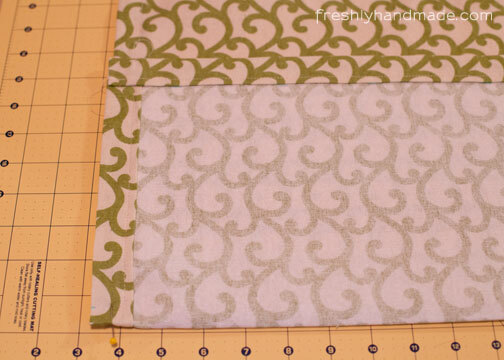 Instead of just fabric, I bought lined panels that were on sale at the fabric store. Since they were the right width and already hemmed on either side, it saved me a bit of time and money. Great tutorial. I made my roman shade for our motorhome bathroom. Not only did line mine, but I added quilter's batting for insulation. This project was so easy that I am going to make more shades for the entire motorhome. We live in our motorhome and travel North America. These insulated shades are going to be great in the hot and cold climates. Thanks for the tutorial! Your instructions are very clear, and the finished shade turned out great. Thanks for the help! I am trying to make these, but cannot find those plastic rings that you used! Can you tell me where to find those? Thanks! I got mine at the hardware store. . .nylon...next to the washers. Hi there. Thanks for the post! How would you go about making these lined? You have made my windows and I very happy campers. By adding a thermal blackout liner (and bubble wrap!) you also saved me a lot of money! 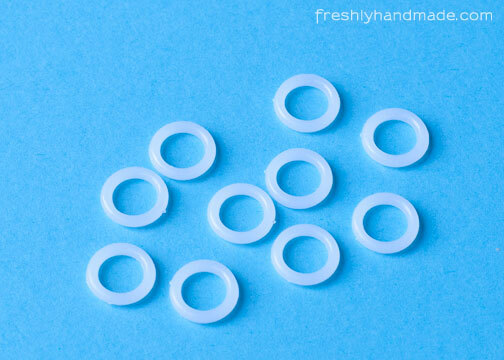 I didn't get the plastic rings at Joanns that you had pictured...I "cheaped out" and went to the jewelry findings section and got some little metal rings instead. We'll see how long they last! That sounds like a great idea! I made shades like this a few years ago, but I am constantly having to replace the plastic rings because they break. My shades are made from a heavy material. I am going to try your idea about using jewelry rings. Thanks. What does it look like on the outside? Not many folks show that in their pics. Wow. My mom and I did this! Lined them too! Thank you so much for your guidance. 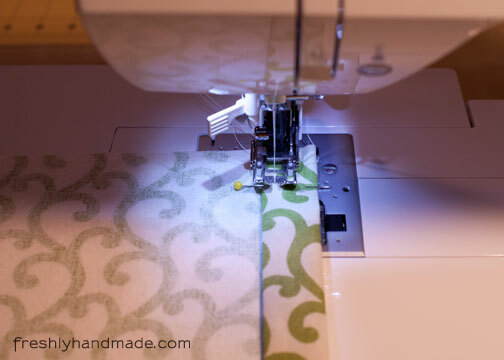 I have been wanting to make a Roman shade for a few years! You have made it possible! Thank you for the pics and easy to understand instructions! Thank you for the best tutorial.......I will use this one after looking at a few others. I agree! I looked at several, but this was not only the most clear instructions, but it looks like this will be a very sturdy end result. 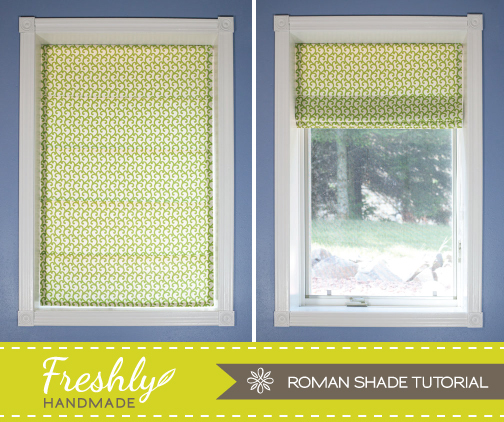 I already made "Roman Shades" with the faux tutorial which I would not recommend to anyone especially if you want to use them. I just ripped off all the glue on the back of the fabric I used, which is very nice fabric and I sewed black out fabric to the back, but now I want to adapt the fabric to do what you did because it looks so sturdy and well done, but I am not sure how to add the dowel holes since it's perfectly the right size. What do you think I could do to adapt? 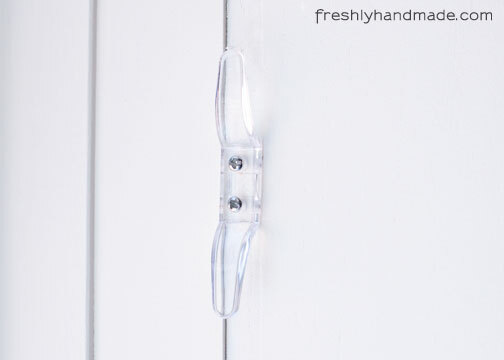 I would like to make these for my patio door/windows, but they would sit on the outside of the window. How would I go about mounting the wood part? I will like to thank the person who took the time to share this window treatment. I understood the step by step tutorial with the added benefit from the photos since I also learn visually. I will definitely try this out. I always wanted to learn how to make this. Thanks so much. Mellanie.